Click on the menu tabs to see images of our three Torahs. “Lisbon” Torah (created in Morocco). With the story of how we obtained it from Portugal. 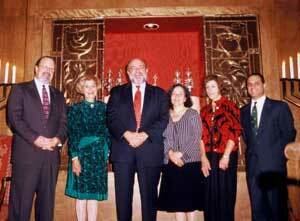 Read about the artist of the Torah covers and see pictures of the dedication ceremony. N. Amanda Ford, fiber artist, is known for her innovative and spiritually inspired designs that interplay with her exciting use of color. She dyes her own fabrics. Her quilting techniques and her eye for perfection accomplish high visual impacts on works that range from full-sized bed quilts to wall hangings and Torah Covers. Amanda is a self taught quilt artist. She studied with nationally known artists at the Quilt/Surface Design Symposium in Columbus, OH from 1989-2001. Other degrees include a BSN from the University of Maryland in Baltimore in 1976 and a BA from Pfeiffer College in Misenheimer, NC in 1971. Her quilts have received many awards at both national and juried shows throughout the country. She won First Place at Quiltfest USA in Louisville, KY and two Honorable Mentions at the American Quilting Society’s show in Paducah, KY.
She has exhibited in Tactile Architecture at the Decatur House in Washington, DC and Houston, the Virginia Quilt Museum in Harrisonburg, the Janice Charach-Epstein Museum-Gallery of the JCC of Detroit, B’nai B’rith Klutznick Museum in Washington , DC and the Yeshiva University Museum in New York. She teaches machine quilting and fabric dyeing at G-Street Fabrics in Rockville, MD, and has contributed several quilting articles to American Quilter Magazine. 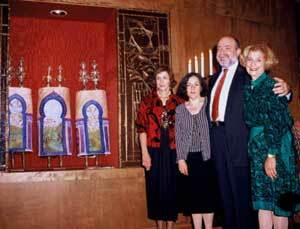 Her work can be seen in many synagogues across the country including the Jewish Theological Seminary and Sutton Place Synagogue in New York City . She was raised in Newport News, VA and now resides in Cabin John, MD with her husband, Craig Dreilinger and daughter, Rebecca, a student at Brandeis University. Son, Aaron, is married and lives in Maryland. and Guest – Rabbi Scott Sperling.